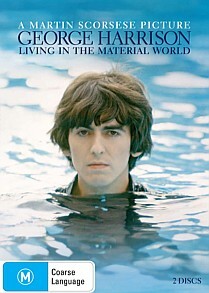 George Harrison: Living in the Material World DVD Review Recommended for anyone with even a passing interest in Harrison, documentaries or the Beatles. Beatle Mania is something that’s hard to imagine today. No matter how famous Justin Beiber gets it won’t touch how bug nutty the world went for the Beatles in the 60’s - something that’s followed us for fifty years now. George Harrison was a quarter of that group and in that respect its’ not really surprising that a member of the most famous bands in the world has such a documentary made about him. Clocking in at nearly three hours this explores the life and times of “The Quiet Beatle” in some depth through archival footage, recorded interviews with friends, family and press coverage of the time. Many of which are never been seen before interviews with key players Paul Mcartney, Ringo Starr, George Martin and Eric Clapton were conducted specifically for the documentary. As well as Dhani Harrison (who looks so much like his father it’s not funny). This is a good documentary, it’s exhaustive but then Beatlephiles would have nothing less and Harrison (who succumbed to cancer in 2001) is an fascinating subject almost by default. But therein lies one of the big questions of the doco, given how interesting Harrison is, given the extent of footage that exists of him and given his attachment to the Beatles was there any way of making a boring documentary about him? In many ways the genius of this piece is allowing the footage and interviews to speak for themselves. There is very little in the way of commentary and no narration at all. It’s not a new trick but it’s the best way to present someone like Harrison. If you’re a real Beatles fan or you’ve seen The Beatles Anthology there won’t be much new revealed in the first half of the documentary although its focus in George is refreshing it’s the second half that will be of more interest. Of course it’s the second half that’s got the emotional impact as friends and family talk about the impact George had on their lives and how much they miss him now that he’s gone. George certainly had a strange assortment of celebrity friends; Monty Pythons’ Terry Gilliam and Eric Idle line up with Racing driver Jackie Stuart and the Traveling Wilburries Tom Petty to talk about George. The second half also has a more revealing interview with Eric Clapton who famously ‘stole’ George’s wife Patty Harrison from him (have so many good songs been written about one woman before, or since?) and Georges’ reaction. This is hardly a warts and all documentary and Paul Mcartney’s revelation that whilst on tour George was a “Red Blooded Male” nudge, nudge, wink , wink, say no more is hardly going to make headlines but it is revealing and put events in context not just historically but musically with select cuts of George’s music playing throughout the whole thing. Recommended for anyone with even a passing interest in Harrison, documentaries or the Beatles. Video: Video quality is excellent all the way through despite the video being taken from multiple sources throughout history. Audio: Those with a decent surround sound setup will be rewarded with an amazing 5.1 DTS mix that leaps from your speakers. The mixes of Harrison’s music have been lovingly crafted, well worth it for this alone. Special Features: One live performance and Dhani, George Martin and his son Gilles Martin going through the mix of Waiting for the sun which is really only interesting if you’re a big fan. Additional interview snippets includes a bit more with Paul McCartney, Eric Clapton, Jeff Lynn and racing driver Damon Hill.